You are at:Home»Arts & Entertainment»Choose Your Own Adventure! On May 23, 2006, Chooseco published an updated version of The Abominable Snowman as the first of their reissues of the Choose Your Own Adventure gamebooks from the early 1980s so dear to this author’s heart. 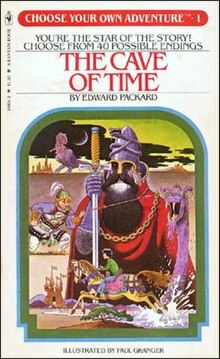 Bantam Books published the original series from 1979 (the year of this author’s birth) to 1998. As such, I grew up reading these books and still have most of them on shelves in my personal library. If you have children aged 10 to 14, I strongly encourage you to share these volumes with them as a way of getting them interested in literature and also getting them to think critically about choices and consequences. If you are unfamiliar with them, as a brief explanation of what they consist of, imagine reading a novel in which you are the star and periodically you are faced with a difficult decision. You are then given a choice as to how to proceed in the novel by selecting a page to turn to in order to continue the novel down a particular path. As with real life, a poor decision could abruptly conclude your adventure. Moreover, because these books have multiple paths, you can in effect read the same book multiple times and each time have a unique adventure. Click here for a “choose your own adventure” experience on this site! Montgomery, R. A. The Abominable Snowman (Choose Your Own Adventure #1). Chooseco, 2006. Previous ArticleJackie Cochran: The 1st Supersonic Woman! Dr. Zar graduated with a B.A. in French and history, a Master’s in History, and a Ph.D. in History. He currently teaches history in Ohio.